Next month, Fairytale Brownies customers will be able to place custom gift orders online without the help of a customer service representative, without an art set-up fee and without a minimum purchase. Fairytale Brownies' new logo upload feature will save customers time in ordering. Fairytale's goal always is to make gifting easy. Customers who purchase large quantities of custom gifts usually order through a sales representative. Fairytale’s reps are still available, but for those customers who don’t want the extra attention, the new online feature will be perfect for them. These customers will be able to choose the custom gifts to send in whatever quantities needed. They choose the “select artwork file” button on the product details page to initiate the artwork file upload, and then select a JPG, AI, PDF or EPS file from their computers, accept some terms and conditions and upload the files. A rendering of what the logo will look like on the gift packaging will appear on the computer screen for the customer to approve. Once the customer’s logo has been uploaded, it is stored and can be used for future orders. The customer also can change logos when needed. The same logo can be used on the gift message cards. The result is an elegant gift branded with the customer’s full-color logo and filled with gourmet treats. The new online upload feature will be available on Sept. 9. As always, if a customer ever has a problem ordering online, a customer service representative is available to help at 800.531.5209. ABOUT FAIRYTALE BROWNIES: The company has been baking brownies since 1992. Every batch is made by hand using a secret family recipe. The brownies, cookies and bars are all natural, baked with the finest ingredients such as imported Belgian dark chocolate, farm fresh eggs, pure creamery butter, and dark brown sugar. 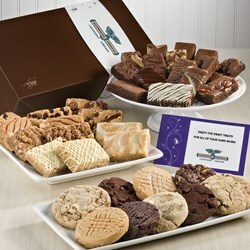 Each brownie, cookie and bar is individually wrapped and certified kosher dairy.